First migration to Michigan’s lower peninsula. According to Potawatomi tradition, the Odawas, Ojibwas and Potawatomi were initially a single tribe, known as “three fires” or “three brothers,” due to their similar way of life. War ensued when the Iroquois Confederacy, supplied with British firearms, began infringing upon Potawatomi hunting territory. First known contact with the white civilization. Drawn by the curiosity of white skin and long beards, the Potawatomi, then living in the Michigan area, traveled to Wisconsin to meet the French explorer Jean Nicolet. The Potawatomi were driven into the Wisconsin area by the Iroquois Confederacy, and there entered into trade relations with the French, becoming politically and economically dependent upon the French. The Potawatomi allied with the French during the Seven Years War, who eventually lost the battle for control of the “New World.” In need of trade goods, the Potawatomi entered into an alliance with the British. When the Revolutionary War began, the Potawatomi initially chose to stay neutral, but eventually sided with the English in a losing battle. The American colonies made the tribes pay dearly for siding with the British. The Potawatomi referred to the American colonies as “13 Fires.” The Potawatomi and other tribes aided in the victorious uprising at Fort Recovery, Ohio. A coalition of Potawatomi, Delaware and Mingos defeated an American militia commanded by Col. William Crawford. In tribal legend, the Delaware were considered the “older brother” by the Potawatomi. Battle of Blue Licks, August 18, was the last major Potawatomi action in the Revolutionary War. Preliminary treaty signed November 30, ending the Revolutionary War. The British maintained ties with the tribes in case the union between the states crumbled. Several treaties, including the Treaty of Fort Wayne eroded the Potawatomi land base in Illinois and Indiana. Potawatomi sided with the great Shawnee leader, Tecumseh, who advocated a “Red Confederacy” to defeat the oncoming white civilization. The tribes failed to resolve their differences and the “divide and conquer” concept prevailed. As natural resources and the fur trade declined, the Potawatomi began to rely more heavily on the commodities and government of the white man. Many new agencies were established at Green Bay, Prairie du Chien and Peoria. Forts were built at Chicago, Green Bay, Prairie du Chien and Rhode Island. 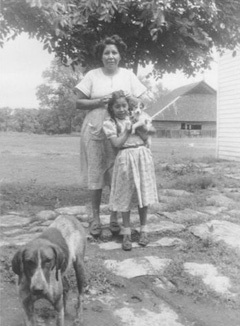 Tribal fragmentation and growing dependence upon annuities made the Potawatomi susceptible to the government’s aggressive land policies in the post-war period. The 1829 Treaty of Prairie du Chien reserved two sections of land near Paw Paw Grove, Illinois for Potawatomi Chief Shab-eh-nay and his Band. Prompted by humanitarian reasons, the U.S. government initiated a removal policy, depriving the Potawatomi of additional land through the treaty process. In 1830 the Indian Removal Act narrowly passed and was signed into law by President Andrew Jackson. The Potawatomi relinquished the remainder of their initial 28 million-acre homeland in the Great Lakes area, when the Treaty of Chicago was signed, except the reservation granted by the Treaty of Prairie du Chien, which was never included in the cession treaties. The tribe splintered, with some moving west, others fleeing to Canada, and some finding refuge in the nearby forest. Some tribes later returned to the area. The Potawatomi settled in “The Platte Country” area of Missouri. The State of Missouri soon annexed the land after a successful lobbying effort. The Potawatomi divided into two separate groups. One group went to the Council Bluffs area of the future state of Iowa; the other settled in future Linn County, Kansas. The tribe was divided over the acceptance of European culture and religion. The Potawatomi resided in two separate areas until the settlers and politicians annexed the tribal land. In July 1846, a treaty reunited the two Potawatomi groups, however, they did not settle together. One tribe settled on the Kansas River and the other on the Big and Little Soldier Creeks in future Jackson County. Tribal land encompassed 576,000 acres. In 1849, the reservation granted to Chief Shab-eh-nay in the Treaty of Prairie du Chien was illegally sold through public auction by the U.S. government. Since an act of Congress or a subsequent treaty is necessary to extinguish the Tribe’s right to that reservation, it continues to legally belong to the Prairie Band. The passage of the Kansas-Nebraska Act opened tribal land to white settlement. Squatters occupied tribal land before treaties could be signed. Past tribal land differences, based largely on religion, couldn’t be resolved, so a new treaty was initiated. The tribal band from Linn County became U.S. citizens, while the other retained the common land, choosing to follow their traditional, ancestral ways. The Treaty of 1861 was revised, and two new tribes were formed. The Prairie Band of Potawatomi kept 77,358 acres in Jackson County. The Citizen Band of Potawatomi sold all their Kansas holdings and moved to the current area of Shawnee, Oklahoma. Despite tribal objections, passage of the Dawes Act forced tribal members to surrender additional land. The law made it easier for tribal members to sell their land and the existing land base soon dwindled much like the Citizen Band’s in the 1860s. Despite having no U.S. citizenship, many tribal members fought in World War I. Leonard Tapsee lost his life in France, in 1918. The Great Depression begins. The tribe, like most of the country, improvised to survive. Indian Reorganization Act. Opposed by those tribal members favoring a “Chief” concept of government. A business committee formed in mid-1930s. World War II begins. Many more tribal members serve honorably in the war. Over 250 Indians from the four reservations in Kansas enlisted. Laverne “Sas weh” Thomas died March 3, 1945 at Iwo Jima and George “Wamego” Wamego died in France. Indian Claims Commission formed, marking the beginning of Minnie Evans’ leadership. Korean War. More tribal members participate. Called the “Forgotten War.” Vernon Mzhickteno lost his life in this war. Minnie Evans intervened to prevent tribe from being eliminated. Vietnam Conflict. A time of division within the country and the Potawatomi reservation. Victor Hale and Martin Jim Jr. lost their lives. Their names appear on the Vietnam Memorial Wall in Washington, D.C. Close to 58,202 men and women died between 1959 and 1975. Among these were 626 Kansans, 382 Indians and seven women. Tribal constitution suspended by the Bureau of Indian Affairs due to the tribe’s interior political power struggle — an unpopular decision among tribal members. Tribal constitution reinstated, due to a calming of tribal factionalism, resulting in new programs and housing. Thirty-six homes were built in phase one of the Housing and Urban Development program. Sixty more followed. O’Ketchoshawno Center built — a combination office, senior citizen center and gymnasium. Tribe assumes control of a bingo operating venture, stabilizing financial operations for the next 10 years. National Indian Gaming Act passed. The express purpose of the act was to provide a federal statutory basis for operation of gaming by Indian tribes on Indian lands, promoting economic development and strong tribal governments. On June 23, Governor Finney approves compacts for the four Kansas Indian tribes, but is later overruled by a Kansas Supreme Court decision stating prior legislative approval is necessary. First Potawatomi gathering in Canada, hosted by the Canadian Potawatomi. Cultural ideas, traditions and history were exchanged by all seven bands of Potawatomi. Kansas state legislature approves tribal-state compact by a slim margin. Second Potawatomi gathering in Mayetta, Kansas. Hosted by the Prairie Band. Third Potawatomi gathering in Wilson, Michigan. Hosted by the Hannaville Potawatomi. Tribe opens temporary casino on October 25. May 14 ground-breaking for New Harrah’s Prairie Band Casino facility. Road Improvement Project initiated. Early Childhood Education Center dedicated. Language Preservation Grant approved by ANA. Fourth Potawatomi gathering in Shawnee, Oklahoma. Hosted by the Citizen Band of Potawatomi. New Harrah’s Prairie Band Casino opens January 12. Road Improvement Project completed, ending years of sub-standard road conditions. Fifth Potawatomi gathering in Niles, Michigan. New Tribal Law Enforcement Center completed. New Tribal Government Center completed. Work starts on new Senior Citizen Building. Sixth Potawatomi gathering in Dowagiac, Michigan. Hosted by the Pokagon Band of Michigan. PBP Nation Station gas station and convenience store completed. Second phase of Road Project starts. New housing planned for reservation. New Elder Center opens. Potawatomi Gathering is held in Carter, Wisconsin. Construction begins on 24 new reservation homes. Harrah’s Prairie Band Casino expands adding 250 slot machines. Bingo Hall returns to its original location at 162 and Q Road. Government Center lower level expanded to provide additional services. Reservation Road Improvement Plan put into place. Ground breaking for new Boy’s and Girl’s Club building. Fire station completed. Ben-no-tteh Wigwam Early Childhood Center addition completed. Potawatomi Gathering held in Canada. New 5-year contract written with Harrah’s for management of Prairie Band Casino. The Nation contributes $200,000 to the Royal Valley school district to support the education of youth. Churches on the reservation are renovated. Phase one of the wastewater treatment plan is completed with a new treatment plant serving the Government Center. 10,300 acres of land are purchased and returned to the reservation. The Nation contributes $50,000 to the Red Cross to help tornado victims in Hoisington, Kansas and $100,000 to support victims of the terrorist attacks in New York City and Washington D.C.
Groundbreaking for the Boys and Girls Club expansion, late 2002. The Nation and Harrah’s announce a $55-million expansion plan. Prairie People’s Park is refurbished and the 2002 Gathering of Nations is held at the rejuvenated park. Harrah’s pays $500,000 toward the renovation of the park and to help fund the Gathering of Nations as part of the new contract. The first phase of 12 homes was completed – and fully occupied. Construction begins on two, eight-unit apartment buildings and six family duplexes. A program is launched assisting tribal members across the country with housing, down payments and renovation costs. Maintenance and Land Management buildings are completed. Fiber-optic cable is installed creating a high speed data network for 17 tribal departments covering several miles of reservation land. The Nation provides a $32,000 gift to Jackson County to upgrade their 911 system. Individuals living on the reservation are allowed a choice of emergency responders from the Nation or Jackson County. The Nation sends Tribal Emergency Services firefighters to assist in fighting fires in the mountain states. Time Magazine runs a news story heralding the Nation’s use of gaming revenues to improve conditions on the reservation and in the surrounding community. Nine replacement homes are built for seniors over 65 living in homes more than 50 years old. New Sprint cellular tower is built providing service to the reservation. Construction continues on two, eight-unit apartment buildings and six family duplexes. Plans are laid for 15 Senior Garden apartments, three manufactured homes (for transitional housing) and 12 manufactured homes for additional housing. The second phase of construction on twelve four- and five-bedroom homes begins. Seven additional miles of roads are paved. Two water towers are constructed: a 300,000-gallon tower to serve the center of the reservation with an 8″ water line and a 200,000-gallon tower to serve the casino expansion. Ground is broken for the casino expansion. A new waste water treatment plant is started for the casino. A new Food Distribution building is constructed next to the Land Development building. Martin Luther King Association acknowledges the Nation for outstand-ing charitable efforts. Long distance learning program started with Haskell. A bike and pedestrian trail is started to connect the housing clusters and the old ballpark. A $350,000 grant is received from the state of Kansas to assist in completion of the trail. Gaming Commission Election was held with Jona Potts-Rupnicki and Calvin Evans winning positions. Two per-capita ordinances were also passed with the first increasing distributions to tribal members from 24 percent to 30 percent and taking that 6 percent from economic development. The second ordinance increased per capita distributions from two to four times a year. Tribal Council election held in July with Rey Kitchkumme winning as vice chair, Ryan Dyer as treasurer, and Jackie Mitchell and Juanita Jessepe taking positions as members. A special Tribal Council election held in October was won by Jim Potter for a two-year term. A new water tower located near L and 158 Road was built that increased water storage to 300,000 gallons. New larger water lines were also installed to pump water to the east side of the reservation. We-Ta-Se American Legion Post #410 celebrates 15 years as a post and flag and honor guards participate in several 2004 Lewis & Clark Bicentennial Commemoration events in Kansas. Senate Bill #9 authorizing tribal police officers to enforce state laws against non-Indian offenders on the reservation. Groundbreaking ceremony for Prairie Village Garden apartments held May 28. Harrah’s Prairie Band Casino gets expansion of three-story 190 room hotel, a Three Fires steakhouse restaurant, Prairie Village gift shop and 12,000 foot convention/event center. 10th Circuit U.S. Court of Appeals grants judgment to the PBPN that invalidates the state’s motor fuel tax on fuel sold by the PBPN convenience store. The Tribal Court conducts first jury trial ever in the Nation’s history on Sept. 21. Boys & Girls Club expansion grand opening held Sept. 17. Prairie Band acquires new tribally-owned ambulance. James Wabaunsee wins special Tribal Council election. Bingo Hall renovation completed. Native American Singers & Dancers take first in 2005 Battle of the Plains Competition. PBP Family Health Center relocated to 510 Kansas Avenue, Holton, Kan. Groundbreaking for new health center on 158 Road held. Gary Mitchell and Joyce Guerrero elected to Gaming Commission. Tom Tuckwin appointed to Gaming Commission. Milton LaClair, retired chairman of the Gaming Commission, wins National Gaming Commission (Bruce Longhorn) award. PBPN wins court appeal on recognizing tribal tags from state of Kansas. Distance Education Learning Lab building placed in K Road complex. PBPN Road & Bridge and JacksonCounty hold ribbon cutting ceremony on Dutch Creek bridge on K Road. Road & Bridge pave six miles of on reservation. Groundbreaking ceremony for community center held and fourteen additional homes under construction in Prairie Ridge. Senior Citizen Prairie VillageGarden 15-unit apartments and community center constructed. PBPN purchases local propane businesses and opens tribal business enterprise as Mayetta Oil Company. 2005 Huron Band Potawatomi Gathering held. Potawatomi News receives Native American Journalists Association media award. PBPN donates $50,000 to Katrina Relief Fund. Economic Development begins wind energy feasibility study. Language Department receives Administration for Native American (ANA) grant to provide Potawatomi language classes. PBP argues motor vehicle tax case before U.S. Supreme Court and decision pushed back to lower court. PBP Tribal Investigations Policies and Procedures developed. Construction begins on casino interchange at Highway 75 and 150 Road. Harrah’s announces it will withdraw from managing casino after 2008. Buffalo Grill restaurant opens in casino. Casino interchange at Hwy 75 and 150 Road opens. Zach Pahmahmie resigns as tribal chairman. Tracy Stanhoff appointed interim tribal chair. Tom Tuckwin elected to Gaming Commission. Transition from Harrah’s to Prairie Band Casino begins. CommunityBuilding renovated and machinery shed constructed near Lands building. PBPN contributes $100,000 to Boys & Girls Club endowment in honor of 100th year anniversary of Boys & Girls Clubs. PBPN purchases 128 acre farm in Shabonna, Ill. to reclaim original homeland. Tracy Stanhoff, James Potter, and Warren Wahweotten, Jr. win Tribal Council election positions. PBPN members participate as part of Team Kansas in Native American Indigenous Games held in Denver. Fourteen families move in to new homes in Prairie Ridge. 2006 Pokagen Potawatomi Gathering held. New PBP Family Health Center opens and dental services offered. Early Childhood Education Center receives national accreditation from the National Association for the Education of Young Children. Four new transitional homes constructed at 158 Rd and K Rd. Historical signing of intergovernmental agreement between PBPN and DeKalbCounty to build a 24-hour bingo facility on the 128 acres reservation land in Shabbona, Illinois. Tamara McClammy and Calvin Evans elected to Gaming Commission. Revenue Allocation Plan approved by membership. The Nation reorganizes and reduces government operating budget in line with approved Revenue Allocation Plan. Gary Mitchell and Larry Mzhickteno win Gaming Commission seats and Rencie Eteeyan and Ruth Vega-Harjo win Ethics Commission seats. Prairie Band Casino & Resort renames and remodels buffet to Longhouse Buffet and renovates gaming floor. In May construction begins on Firekeeper Golf Course with June press conference kick off featuring Notah Begay III whose firm designed the course. Tribal Council attends Presidential Inauguration and travels to Shabbona (DeKalb), Illinois in February for community goodwill outreach tour. Road & Bridge staff travel to Shabbona in spring to plant native grasses and build fish hatchery in summer. PBPN hosts Potawatomi Gathering and holds annual pow-wow and Indian Day/Veterans pow-wow throughout the year. New Judicial Center building constructed and opened in December. PBPN develop start-up businesses: Prairie Band Construction, Inc. and Prairie Band Health Services, Inc. PBPN Code of Ethics written and approved by General Council. Carl Matousek named Employee of the Year. Potawatomi News changes format and launched online as part of www.pbpindiantribe.com. Twelve candidates file for Tribal Council/Gaming Commission Election. Steve Ortiz wins chair, Junior Wahweotten, Tribal Council member, and Rey Kitchkumme, Gaming Commissioner. Run-off election for Secretary held between Dawn “Sogi” LeClere and Jim Potter; Potter wins. Cecelia “Meeks” Jackson honored for contributions to language program. PARR Recovery House closes. Firekeeper Golf Course holds soft opening in fall for tribal members. PBPN Education partners with Friends University for first on-site college degree courses and programs. Potawatomi Fire Department celebrates 30 years with open house. Brennah Wahweotten selected 2010 Potawatomi princess and Sylvana Levier Jessepe 2009-1010 We-Ta-Se princess. Jancita Warrington appointed to Tribal Council. Chairman Ortiz becomes vice president for Oklahoma City Inter-Tribal Health Board and selected to Dept. of Health & Human Services Secretary’s Tribal Advisory Committee, Local Government Advisory Committee (EPA national committee), DOI Tribal Consultation Committee and attends second annual White House Tribal Nations Conference along with Jancita Warrington in Washington, D.C. Dec. 16. New online link for tribal members only added to website at pbpindiantribe.com. Little Soldier Singers, We-Ta-Se Color Guard, Chairman Steve Ortiz and Tribal Council participate in Kan. Gov. Sam Brownback’s Inauguration activities in January. Firekeeper Golf Course opens April 1 and holds grand opening with sports celebrities Roy Williams, Bill Self, and Notah Begay on May 15. Amber Walker chosen Employee of the Year in Jan. Health Center gets electronic health records system. Chairman participates in National Tribal Health Reform Implementation Summit in Washington, D.C. in April. Brave Dance building constructed on 158 Road. Health Center receives accreditation from Joint Commission’s Gold Seal of Approval. Cecelia “Miksekwe Jackson, 88, last fluent speaker of the Potawatomi language in Kansas dies on May 29. Mittena Hale named 2010-11 Prairie Band Potawatomi princess at annual pow-wow in June. Chairman Steve Ortiz named to Governor’s (Kansas) Economic Development Council. PBP member Charles Chaput becomes Archbishop of Philadelphia in Sept. Jerry Tuckwin and wife Terry honored with Jim Thorpe Award in Albuquerque for volunteer work with Native American youth in sports. Burton Warrington (PBP) named President/CEO of Prairie Band LLC. Four tribal youth attend National Intertribal Youth Leadership Summit sponsored by White House. Expansions made on tribal police, commodities, and construction/maintenance buildings. DonDon LeClere and Mary LeClere recognized for 20 plus years of service to the PBPN. PBPN elders and others travel to Gathering in Hannahville, Michigan in August. Amber Mahkuk named We-Ta-Se princess at 14th annual veterans pow-wow in September. Anna Boswell named Assistant General Manager of Tribal Operations in October. Tribe participates in National Drug Take Back Day with U.S. Attorney Barry Grissom and as a collection site. Tribal Victims Assistance Program mounts Community Story Tree Project to bring awareness to domestic violence and PBPN community. PBPN participate in Tribal Kansas 150 Commemoration event at Kansas Museum of History. Noah Wahquahboshkuk appointed treasurer of Tribal Council. Chairman Ortiz selected as one of 12 tribal leaders to meet with President Obama during 3rd annual White House Tribal Nations Conference in December. Steve Ortiz, tribal chairman, elected co-chairman of Health & Human Services Secretary’s Tribal Advisory Committee (STAC) in Washington, D.C; Francis Jensen inducted into Holton/Jackson (Kansas) Chamber of Commerce Hall of Fame; National Indian Gaming Commission approves reducing the PBPN Gaming Commission from five seats to three in February; Tax Commission formed with amended PBPN Law and Order Codes; E POK YATSOLKAGNEN Language Winter Stories Conference held Feb. 20-21; Royal Valley Singers & Dancers win Battle of the Plains championship; Six PBPN employees or tribal members graduate from Friends University/PBPN on-site college-degree program; Annual PBP pow-wow draws over 500 dancers and 18 drum groups in June; PBPN leaders help push through the state legislature the use of tribal identification cards for new voter registration process; Golfweek National Pro Tour held at Firekeeper Golf Course; Sixteen candidates file for Tribal Council/Ethics Commission Election-Hattie Mitchell wins treasurer, Joyce Guerrero wins Vice Chairman and Carrie O’Toole and Tom Wabnum win Council seats; PBPN begins Child Support Services program; Family Violence Prvention Program and Tribal Victims Assistance Program merge into Tribal Victims Services Program housed in Social Services Department; PBPN host 63rd Annual Native American Church of North American Conference; We-Ta-Se American Legion Color Guard places in two categories at 94th American Legion national color guard competition; We-Ta-Se host 15th Annual Veterans pow-wow in September; PBPN programs and departments collaborate to provide community events like Rez-Lympics, Easter Egg-stravaganza; Big Bear Moon Sobriety Pow-wow, Walk a Mile in My Mocs, Splatters That Matter andTrunk or Treat that are well attended; Elders and others attend Gathering hosted by the Nottawaseppi Huron Band in Fulton, Michigan; Over 400 people attend Kateri Tekakwitha canonization at Our Lady of Snows Church on Oct. 21; Sam Mitchell named Employee of the Year; Prairie Band LLC invests in Terra Centre high rise building in Sioux City, Iowa and launches new website; Chairman Ortiz attends fourth annual White House Tribal Nations Conference in December. Three Tribal Council members attend Inauguration activities for President Obama in Washington, D.C.; Rick Burns named 2013 Employee of the Year; Other selected quarterly employees for 2013 include Verna Simon, Brenda Catron, and Eddie Joe Mitchell; Tribal leaders testify to make Native American Day at the Capitol permanently recognized in 2014; Tribal Victim Services receives a national Professional Innovation award from the Office of Violence Against Women/U.S. Department of Justice for their Healing Through Arts program; Language students win five awards at the Oklahoma Native Youth Language Fair in April; Prairie Band Casino & Resort renovates Nation Station Convenience Store that includes a Subway Restaurant and refurbishes some hotel rooms to VIP suites; Danessa “Nawnee” Littleaxe named Prairie Band Potawatomi princess at annual Potawatomi Pow-wow in June; Gary Mitchell and Larry Mzhickteno win Gaming Commission seats; We-Ta-Se 16th annual pow-wow held in September with Felicity Price crowned as princess; Hattie Mitchell selected to National Center for American Indian Enterprise Development Native American 40 under 40; Mas Hale and Deb Matchie Wakole selected as honored elders for 2013; Joyce Guerrero, vice-chairperson, represents PBPN at White House Tribal Nations Conference; PBPN Education begins partnership with Rasmussen College; Big Bear Moon Pow-Wow held Dec. 31 at Bingo Hall. Tribal member Venida Chenault selected President of Haskell Indian Nations University; Roy Hale inducted into Jackson County/ Holton Chamber of Commerce Hall of Fame; Brenda Catron named Employee of the Year; Youth language students win trophies at Oklahoma Native American Youth Language Fair in Norman, Okla.; PBPN participate in Healthy Kansas Tribes 2020 Initiative with State of Kansas; PBPN selected as one of 21 tribes for first implementation of Cobell Land Buy-Back Program; Tribal Secretary James Potter killed in motorcycle/deer accident in June; Sophia Suke named PBPN pow-wow princess; Tribal Council help dedicate historical marker for Chief Shabbona near Shabbona, Illinois; Tribal Council/Gaming/Ethics Commission Election for 2014 elects Warren Wahweotten Jr.(Tribal Council Member), Liana Onnen (Tribal Council Chairperson), Camilla Chouteau (Secretary) and Rey Kitchkumme (Gaming Commissioner #3) and no candidates file for Ethics Commission; PBPN travels to Gun-Lake Match-e-be-nash-she-wish in Michigan for Gathering in August; 17th Annual We-Ta-Se pow-wow held in Sept with Taryn Boswell selected princess; Firekeeper Golf and Prairie Band Casino & Resort host Symetra Ladies Professional Golf Association (LPGA) tour; Grass-roots “Get Out the Native Vote” nets 114 new registered voters for national election; Early Childhood Education Director Hope Adame wins Kansas, Regional, and National Headstart Administrator of the Year; Tribal Council makes land application with BIA in Minnesota; Don Don LeClere and Mary LeClere named Honored Elders for 2014 at the Firekeepers Elder Center; Tribal Chairperson Liana Onnen attends sixth annual White House Tribal Nations Conference in Washington, D.C.
• PBPN Gaming Commission chairman Gary Mitchell passed away in January. • The late Jim Potter inducted into the Holton/Jackson County Hall of Fame. • Kansas Governor Sam Brownback visits PBPN reservation in February. • Lorrie Melchior sworn in to Enrollment Committee. • Former Chairperson Steve Ortiz received the National Indian Gaming Association Chairman’s Leadership Award. • Prairie Band concludes Land Buy-Back Program with $5,145,493 in sales completed and the Nation acquiring 3,290 acres of land. • One Stop Convenience Store opens at US Hwy 75 and 190th Road. • The PBPN Education department partnered with Friends University to offer an on-site MBA program. • The PBPN Dental Clinic installed state-of-the-art digital imaging equipment and the Health Center began providing limited medical service to non-Native government employees and families. • The 2015 Potawatomi Gathering was held in Crandon, Wisconsin by the Forest County Potawatomi. • General Council votes for Casino expansion to include 200 additional slot machines and a Bingo Facility. • PBP Nation donated over $300,000 in charitable contributions to promote area organizations and events. • PBPN signs memorandum of understanding with the Veterans Administration to allow Native American veterans and their spouses to apply for a Native American Direct Loan on trust land. • PBPN Tribal member Arlene Wahwasuck recognized by Haskell Indian Nations University as Outstanding Alumni of the Year. • Aislyn Levier selected as 2015-16 PBPN Powwow Princess. • PBPN Tribal member Craig Treinen inducted into Kansas Music Hall of Fame. • Our Lady of the Snows Parish celebrated its 100 year anniversary on May 31. • Three are sworn in to Ethics Commission; Mamie Rupnicki – Chairperson, Rencie Eteeyan – Vice Chairperson and Kassie James – Secretary. • Dorothy Kiyukan is appointed to the Gaming Commission. • The PBPN Social Services department through the Tribal Victims Services program opens the TRACKS House. • Chairperson Liana Onnen is sworn in as the National Congress of American Indians Southern Plains Area Vice President. • The PBPN Language department launches Nïshnabemwėn iOS learning app. • The Honorable Elizabeth Kronk Warner is sworn in as District Court Judge and PBPN Tribal member Joshua Arce is sworn in as Public Defender for the Healing to Wellness Court. • PBPN Tribal members Richard Adame and Sara LaClair were recognized as the 2015 Honored Elders. • PBPN celebrates the 75th Anniversary of the Rock Building. • Former Assistant Secretary of Indian Affairs, Kevin Washburn initiated the review process for the land into trust application for Shabehnay. • The Nation successfully negotiated a Tobacco Tax Compact with the State of Kansas which was ratified unanimously by the Kansas Legislature in April. • The Education Committee selected two new members; Adele Wahwassuck and Jason Hale. • Michelle Simon was sworn into the Enrollment Committee. • Frank Tecumseh was appointed to the Prairie Band Potawatomi Entertainment Corporation. • Peggy Houston and Tracy Stanhoff were selected for the Prairie Band, LLC Board of Directors. • The Nation implements Equine Assisted Therapy on the reservation. • The 2016 Election initially had 27 tribal members run for four seats on the Tribal Council and eight tribal members run for four seats on the Ethics Commission. • The Ethics Commission election wins yielded Burton Warrington – Chairperson, Gilreath Aitkens – Commissioner #1, Blake Garrison – Commissioner #2 and Laura Rice – Commissioner #3. • The 2016 Tribal Council elections were determined through a run-off election with resulting wins by Zach Pahmahmie – Vice chairperson, Amanda Barbosa – Treasurer, Thomas Wabnum “Hoppy” – Tribal Council Person #2 and Carrie O’Toole – Tribal Council Person #3. • The Prairie Band Casino & Resort opens the new Bingo Facility. • Tribal member Dr. Venida Chenault is inducted into KU Women’s Hall of Fame. • The Citizen Potawatomi Nation hosted the annual Potawatomi Gathering. • The Prairie Band Potawatomi Nation issued a letter of support and a resolution in support of the Standing Rock Sioux Tribe and their fight against the Dakota Access Pipeline. The Nation also sent two convoys with donations to the Standing Rock camps. • The PBPN Social Services department through the Children and Family Services Program graduates the first class of seven participants in the Native Edition Trauma Informed Partnering for Safety and Permanence – Model Approach to Partnerships in Parenting (TIPS-MAPP). • The PBPN Boys & Girls Club golf fundraiser event nets largest donation amount in 14 year history. • The PBPN We-Ta-Se Post 410 hosts birthday party for veteran Julia Kabance’s 106th birthday. Kabance is the oldest member of the PBP Nation. • The PBPN Tribal Police Department celebrated 18 years of service to the community. Treasurer Amanda Barbosa Nioce resigns position. A special election is held and Wade Pahmahmie is elected Tribal Council Treasurer for remainder of term. Tribal Council Member Carrie O’Toole resigns position. A special election is held and Juanita Jessepe is elected Tribal Council Member #3 for remainder of term. Language Learning Center building is established. Southwood Estates built – a 27 unit housing site. Walpole Island hosted annual Potawatomi Gathering. The Gaming Commission election is decided through a run off election, Dorothy Kiyukan is elected for Gaming Commissioner #1 and Edward “Joe” Mitchell, Jr. is elected for Gaming Commissioner #2. The PBPN General Membership approve a $55M expansion at Prairie Band Casino & Resort. The expansion includes a new hotel tower, interior upgrades, renovation of the Buffalo Grill, expanded gaming floor, new administrative wing, a 500-space parking garage, along with upgrades to the 150th Road corridor. March: Dorothy Kiyukan is removed from Prairie Band Potawatomi Gaming Commission Position #1. 4.4.18: Tribal Council Member #3, Juanita Jessepe, relinquishes position due to health. 4.26.18: Lisa Wamego appointed to Gaming Commission #1 position. July: Prairie Band Potawatomi Nation host site for 25th Annual Potawatomi Gathering. July: Coleen Thomas sworn in to Enrollment Review Committee. 8.30.18: Swearing in Ceremony held for newly elected Tribal Council, Zeke Rupnick -Chairman, Camilla Chouteau – Secretary, William Evans – Member #1, Raphael Wahwassuck – Member #3. November: PBP Nation opens new Behavioral Health Facility. January: Casino Board of Director appointments include Joseph “Chago” Hale, Jr., Hattie Mitchell, Jona Rupnicki, Frank Tecumseh, joining Corey Mzhickteno.